When I read that Pulitzer Prize winning American poet Mary Oliver would hide pencils amongst the trees which lined her sojourns into the words so that no idea would escape when it presented itself, I smiled noting my quiet understanding and appreciation for such a need. I must admit, I was introduced to Mary Oliver quite late in her career, and it is only now, with the news of her passing last Thursday that I am becoming more aware of her fine adoration and observation of Mother Nature and life’s journeys. Mother Nature patiently waits for us to learn what she has known for centuries. From practicing patience as our journeys, relationships, goals and lives move through their seasons in order to come to their most awesomeness revelations, to trusting that indeed a blue sky is behind those grayest of clouds and our heaviest of struggles will pass so long as we choose to learn and apply the lesson moving forward. These are only a minuscule of lessons we can gather from paying close attention to the sage that shares with us her flora and fauna, but as well, the gifts of well-being are abundant. 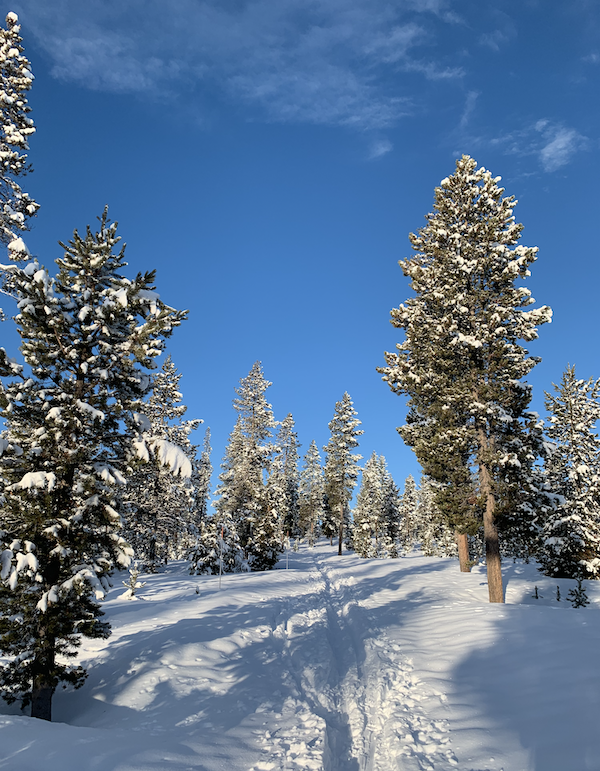 The simple act of going for a morning ski as was captured this past Monday morning in the picture above, to going for a walk in the park during lunch, the comfort, refuge and nudging to be fully present can lift a humdrum day and add an exclamation point on a magnificent one. And perhaps . . . no . . . most certainly, Mary Oliver was our sage here on earth in the human world to deepen our affection for Mother Nature and all the animals that she gifts us with. As a fellow lover of canines, a talent who was not fully appreciated by some critics for they remarked on her simple style, she continued to do what readers adored her for – write her way, in her voice and let her poetry do the talking. And so for anyone who is, like me, becoming more and more acquainted with Ms. Oliver or for all of her long-time readers and fans, may this post be a nod of gratitude to a woman, a writer, a human being who dared to enlightened in her own unique and gifted voice through unadorned poetry that spoke to so many and reminded us all that we have far more in common with Nature and all her creatures than not, and that letting our beautiful selves be shared with the world is an awesome gift to give, no longer harnessed by the restraints of the “voices shouting their bad advice”. I came to Mary Oliver’s amazing work, through my reading Gary Snyder and Wendell Berry and have found her poems inspiring on so many levels. Thank you for sharing The Journey, what an important way to begin my day. I, too, only “discovered” Mary Oliver in the past 10 years. And, OH!, such a lovely discovery. After enjoying 3 of her poetry books, her “Upstream” book of essays absolutely opened a new world. I felt as though I were walking with her through the natural world. After reading your blog for years, it is no surprise you would admire Mary Oliver. Thanks for sharing her beautiful poem. I agree with Stormy Smith. I thought the exact same thing. Thank you for this! The discovery of a writer who speaks to my spirit is such a treasure and look forward to reading more of her works. This poem reminds me of May Sarton’s “Now I become myself” and the book I’m currently reading, Joseph Campbell’s “The Hero of a Thousand Faces”. What a wonderful way to start the weekend! Shannon, thanks for this beautiful poem. Once again I am at a crossroads, and had to make the decision to ‘Save my Life’ and not someone else’s. I heard an older interview on NPR with Terry Gross and Mary Oliver last week in memory of her passing. Great woman that never got the acclaim and recognition she deserved. But maybe that’s the message, live your life your way regardless of the critics.